This multi-level pass play provides a variety of options for the QB depending on the type of pass defense that is utilized. Standard pass blocking is used (i.e., hinge to the outside to form the pocket). Both X and TE should initiate a brief block before continuing their patterns to slow the rush and allow for the deeper patterns to be established. The FB should block to the outside and if a blitz is presented, should stay in the backfield to help protect the QB. If the three primary receivers are covered, the QB should look to the outlet pattern from X or deep to the FB. 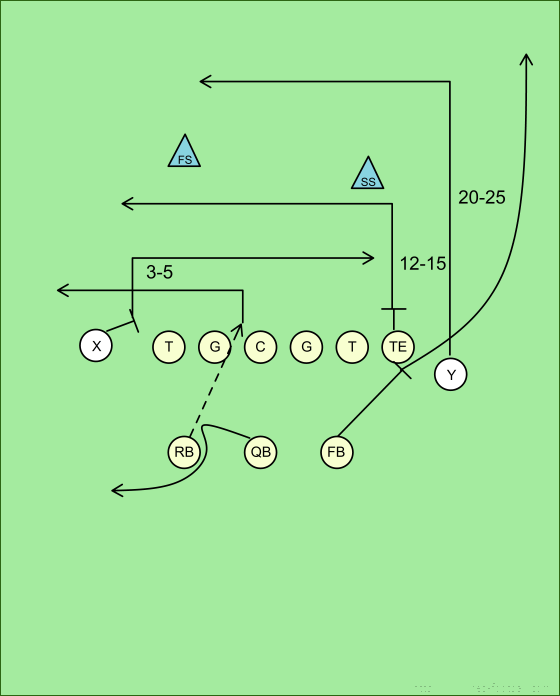 Y's pattern must be deeper than the safeties and the TE pattern must be underneath the safeties. The depths of all patterns can be adjusted accordingly depending on the level at which you are playing and the abilities of your players.